The 1970's era route suggests that even at the low point of cycling in the Netherlands conditions for cyclists were generally better than they are in all but the most bike friendly locations in California. Now that we're two generations removed from biking being a common way for kids to go to school, I fear that building a consensus to build bike infrastructure even that good is impossible. @Winston. I agree, but if you mean by 'generally' that they were present everywhere, then that is not true. Yes, there were cycle paths and lanes, but not in every city, not in every neighbourhood and they were certainly not complete routes. That is why planning a route was so important. But the stretches of infrastructure that were there were indeed of a generally good quality. The main thing that changed after the 1980s and early 1990s is that the Dutch started building complete cycle routes and especially how junctions were built was a huge improvement to the network. That in turn gave a huge boost to the number of people cycling and all those factors improved their safety. Mark - this negotiation of routes is exactly the same in Oxford: so much so that we've explicitly divided routes into "quiet" and "main". The quiet routes are where the 11-yr-olds start, and within a couple of years they go anywhere. @Richard I don't quite follow your reasoning. Because it were the busy streets which were the ones that were safest in 1977. Now there is no difference anymore in safety, only in how pleasant the routes are to use. It is never a good sign to have different routes for different people in terms of skils or age. If your streets are safe for 8 or for 80 year olds they are safe for everybody. Your story sounds familiar. 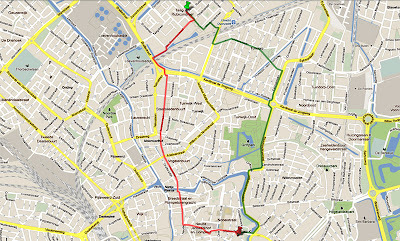 Mine started a bit earlier, in 1951 in Rotterdam when there were hardly any cyclepaths at all. One reason may be that there were so few cars then that it hardly mattered. This changed rapidly. When I left Rotterdam in 1961 cars dominated the roads as everybody who could afford one ditched his bicycle. Economic progress. I remember thinking that my route to school after we had moved homes was so insanely long and dangerous. But then i went on google maps and charted it out, and it wasn't that long (for a 10 year old), but i still think it was not that safe. Lovely experiment! there's been a lot more change in your home town that in mine (in California). My cycling route to secondary school in a suburb of Toronto was 5km, and it usually took me about 15 min. If I rode at 25km/h I would usually get almost all the lights green, so I could average a pretty high speed. Because of shortcuts accessible only by foot or bicycle, and because of car traffic near the school, cycling was just as fast as driving, and almost twice as fast as taking the city bus (my school did not have school buses). It seems your ride to school was also about 15 min, but your distance was shorter. It just goes to show that the argument that cycling isn't practical in suburbs doesn't hold water, because although distances are longer, speeds can be higher as well. I just realized that I don't remember all of my first route to grammar school (we lived right next to the elementary school playground, no need to bike there). Then when my mother and her boyfriend split up two years later we stayed with my aunt and uncle for a couple of months in the woods down South. I had witnessed the columns of high school children biking in from the from the country side before, but this time I got to ride with them. Much more orderly in my memory than the children shown in Mark's video the other day. The two tallest, strongest boys would ride up front to keep everybody out of the wind, and the rest would follow in pairs, chatting most of the way. After that it was mostly suburbs and bike paths. There was a bike lane on the last stretch of the route, again along the river but this time on the harbour side, that I tended to avoid. Not so much because it was a busy road (it was), but more because that is where the police tended to put its red light trap, the fine being about ten times my weekly allowance. Don't know if this is interesting to bike historians (and apologies for being off-topic): somebody wrote a book containing the best bits of the first 25 years Kampioen, the magazine of former cyclist (and current motorist) association ANWB. Eamelje.net reviews the result: about cyclists wondering if they should carry guns to shoot dogs, "cars will definitely not compete with the bicycle", and then---when car owners had taken over the association---the protests against a 10 kph speed limit for cars within built up areas. The book is called De dolle entree van automobiel en velocipee by Leonard de Vries. Our lads will be able to cycle to school: we don't have a comprehensive dedicated network but there are enough traffic calmed streets and short cycle lanes through houses and across fields that it's possible with planning. Trouble is that the schools insist on cycle h*lm*ts and training, run by the German car owners associations, which will do their best to instill habits of fear and submission into young riders. Our lads are instructed that if the instructor says anything silly, just nod, smile, do it on their little practice track, and forget it as soon as you ride home. If sub-standard cycling infrastructure is being built. You might be stuck with it for 30 years or more. That's precisely what happens here in Australia more often than not.